How to add a Printer to Windows, Mac & Chromebook? You can use the printer for official and personal reasons. There are some necessary steps that are to be followed in order to use your printer. You have to install the drivers and add your printer to the queue in the Devices and Printers menu. After doing so, you can use the Printer functions easily. Get simple steps a How to add a printer guidelines. Connect your printer to the system that you use with the USB cable. Open the Settings menu on your Windows 10 system. Choose the Add Printers and Devices option. Wait until your system detects your printer. Select the name of your printer by clicking on it. After adding your printer to the list, follow the instructions that are displayed on the screen. If your printer is not listed, then try Refreshing, and click the option ‘The printer that I want isn’t listed’. Now, your Windows operating system will help you in finding the printer. Your system will download the necessary drivers for your printer. Click the Start menu on your system. Choose the options Control Panel—–> Devices and Printers. Add your printer by tapping the Add printer option. Select the Use an existing port option checkbox and Documents\*.pdf (Adobe PDF) from the drop-down menu. Select Next—–> Have Disk button should be clicked. On clicking the Browse button navigate to C:\ -> Program Files (x86) -> Adobe -> Acrobat 10.0 -> Acrobat -> Xtras -> AdobePDF. Choose the AdobePDF.inf from the given list, and click the OK option. some PDF converters will be displayed, you will have to select the appropriate one, and click Next. Give a name for your printer. Follow all the steps that are prompted on-screen to complete the installation. You can add any printer to the Mac operating system easily. Follow the simple steps mentioned below to connect your printer to the Mac device. Click the Apple menu on your Mac device. Select the System Preferences option. Choose an option from Print and Fax, Print and Scan, Printer and Scanners based on the version of your printer. Check if the name of your printer is displayed in the list. If the name of your printer is listed, then remove and re-add your printer to the list. Click on the option Add Printer or Scanner if your printer name is not listed. In case if you are not able to find the name of your printer in the Add Printer and Scanner list, then connect your printer to the Mac device. The Use or Print Using menu is used to select the name of your printer. Choose Add Printer to your list. Close the System Preference window, and try the print function. Click the Apple icon on your Mac device. Choose the option System Preferences. Select the Printers and Scanners icon or the menu. The plus sign (+) should be pressed to add your printer. A new Add dialog box will open. Choose the Icon IP from the list of menus on the tab. Fill the IP information such as host name, protocol, etc. After entering the details, your system will validate the fields. Use the Generic PostScript or Generic PCL Printer option. Now, how to add a printer to the list, and wait until it is configured. Turn On your Canon printer. Hold the Wi-Fi button by pressing it on your printer. The flashing blue light indicates that your printer is searching for the network connectivity. Once you are connected to the network, your Wi-Fi lamp will stop flashing, and a blue solid light will be displayed. Now, if you are connecting it with the Windows OS, you can use the installation CD, and run the how to setup file to complete the installation. Click Next on the Initialization screen. If you are using a Mac device, enter your system password to install the Helper tool. Click the Install Helper option and tap the Next button. Select the type of connection that you are connecting it with. Make sure your printer is turned On, and click Next. Chromebook is a system that runs on the Google operating system. Follow the instructions below to know how to add a printer to Chromebook. Click on Here launcher on your Chromebook. Open the Webstore on your browser. Download the application HP Printer for Chrome from the store. After downloading, launch the application on your device. Enter a name on the Add Printer field. This name will be given to the folder of your printer. Type the IP address of your printer in the other empty field. After typing the address, click on the Plus sign, which will how to add a printer. Now, go to Google Documents. Select the File of your desire. Click the Print icon or option from the File menu, which will start printing your document. Open the Google browser on your system. Select the Setting option by clicking on the three vertical dots on the right of your web page. Scroll down and choose the More settings option. Go down on the page until you locate the Google Cloud Print option. Click on the Add Printers option to add your printer. You will be navigated to the Printer Confirmation page. Once again, click Add printer, then the option Manage your Printer. You will be navigated to the page to where you can see the list of printers available. Click on the name of your printer. If your printer is not listed, then try refreshing the page, and click the name of your printer. Now, you can print using Google Cloud Print. You can add your printer to any Mac device. In order to connect your printer to an iPad, follow the instructions that are given below. Before proceeding with the steps, confirm whether your printer supports AirPrint. Make sure you connect your iOS device and printer are connected to the same network. Download the AirPrint application from the store. After completing the download process, launch the application. In order to print, click on the Applications Share icon. Tap the Print icon or the print option displayed on the menu. If you are unable to find the Print option, check the user guide because not all applications supports the Print option. Now, choose the Select Printer option on your device. Select an AirPrint enabled printer from the list. Do the necessary changes in the Print properties and click the Print option. You can add your printer to the iPhone that you use by following the basic steps that are mentioned below. Check if the printer that you want to add to your iPhone is AirPrint enabled. If your printer supports AirPrint connectivity, proceed further. Connect the AirPrint enabled printer, and your iPhone to the same wireless network. Download and install the AirPrint application on your mobile. Open the application from the document that you want to print from. In order to find the Print option, click the Share icon on your application. Touch the Print option or the icon that is displayed on the menu. Select the option Add Printer. Now, choose your printer which is AirPrint enabled. Alter the necessary settings, and then click on the Print option. The printer can be added to the list of external devices that are connected with your computer by following the steps that are given below. You can add your printer by using either the Wired or Wireless connection. Install an appropriate software that is necessary for your printer. The how to setup files for the Windows operating system will be in the .exe format and for Mac operating system in the .dmg format. 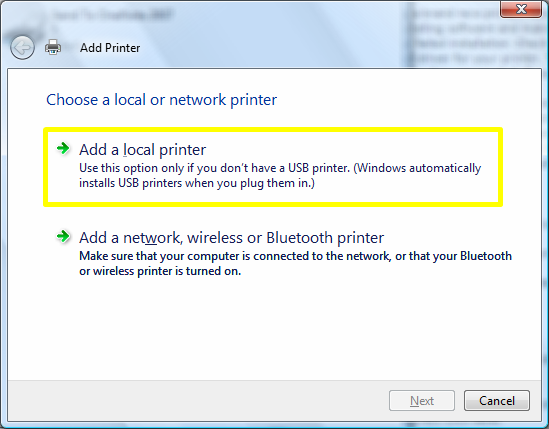 If you choose the wired connection, then connect your printer with the USB cable when you are prompted to do so. If you are choosing the wireless connection, choose the Home network. Make sure you connect your printer and computer to the same network. Turn on your Wi-Fi enabled printer, and choose the Setup option using the arrow keys on your printer. Choose the Network from the Setup menu. Now, select the Wireless Setup Wizard, which will start searching the available networks. Click on your network name and enter the passcode. Wait until your printer is connected to that network. Now, try printing the test page from your computer. You can connect your printer and laptop using the wireless network. Click the Start menu on your portable device. Choose the Settings option from the list of menus that are displayed. Select the Devices option from the Settings dialog box. The Printer and Scanners option is to be chosen. Add the printer or scanner by clicking the plus sign (+). Follow the instructions displayed on-screen to complete the how to setup printer process. Open the document on your laptop. Press Ctrl + P or the File—-> Print option. You can the static IP address to your printer by following the simple steps that are mentioned below. Open the Control Panel —-> Devices and Printers option. Click Add Printer —-> Add Local Printer. Select Create New Port, and choose from the menu ‘Standard TCP/IP’. Click Next option, and enter the static IP that was assigned to your printer. Check if there is an option to Query Printer, and Automatically Select Driver. Click on Next and select Finish. If you cannot find the printer in the list, click on the Have Disk option, and select the appropriate driver when prompted. Select Finish to complete TCP/IP dialog box. Use the default name for your printer, and choose Next. After completing the procedure, try printing a test page.